Games Workshop is more than just Space Marines. 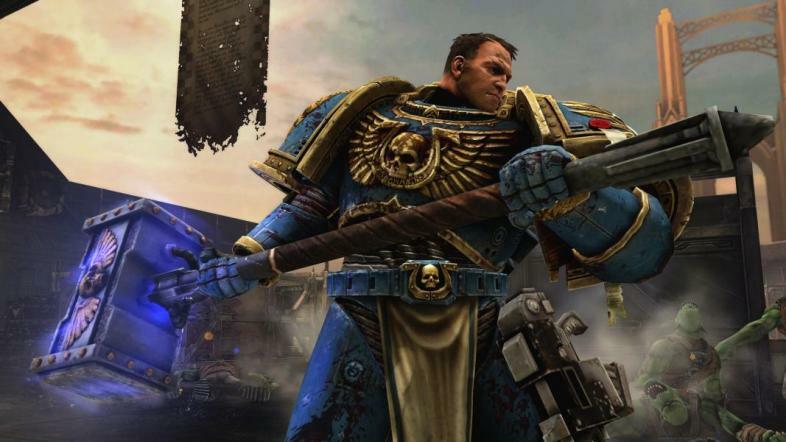 The Warhammer 40,000: Dawn of War franchise has been going strong since 2004, and the recent news that Sega has registered a domain name for Dawn of War 3 has rekindled excitement for this epic series. But how much do you actually know about Games Workshop, the company responsible for everything Warhammer? You have probably played Blood Bowl, the ultra-violent strategy sports game, or Space Hulk, the tactical thriller; you may have even played Warhammer Online, which was officially shut down at the end of 2013. Games Workshop has a much more storied history, however, and we have found some interesting facts you probably didn't know about Games Workshop and PC gaming. 10. The company's founders sold RPGs out of their flat for three years before they could afford a retail shop. Games Workshop's first retail shop, opened in 1975. Games Workshop was founded in 1975 by John Peake, Ian Livingstone, and Steve Jackson, three British gaming enthusiasts living in London. Originally created to produce and sell board games, Games Workshop soon acquired the exclusive rights to distribute the original Dungeons & Dragons in the UK, and so switched their focus to RPGs and wargames. For the first three years of its existence, however, Games Workshop sold games through the mail; it wasn't until 1978 that they finally opened their own retail shop. Since then, they've become an international company with nearly 2,000 staff. Not too bad! 9. Released MS-DOS versions of Space Hulk and Blood Bowl in the mid 1990s. Blood Bowl has come a long way in twenty years! Even if you haven't played Space Hulk and Blood Bowl on the PC, you've likely seen them advertised on Steam. They are both successful, visually appealing games that have helped spread the Warhammer franchise to an even larger fan base. Surprisingly enough, earlier versions of Space Hulk and Blood Bowl were also two of Games Workshop's earliest forays into PC gaming! Space Hulk was first released in 1993, with an expansion coming out in 1995, the same year that Blood Bowl was first released. These MS-DOS versions obviously look very different from their modern counterparts, but they largely stayed true to the original tabletop rules, a trend which Games Workshop continues in their PC games to great success today. 8. Created its own record company in the early 1990s. In the early 1990s, Games Workshop created its own record company called, fittingly enough, Warhammer Records. Unfortunately, Warhammer Records only ever signed one band, D-Rock, a British heavy metal band whose lyrics were heavily influenced by Warhammer 40,000. D-Rock released one album, called Oblivion, and a fragment from one of their songs was used in the original Space Hulk PC game in 1993. 7. Released a turn-based tactical PC game based on its Epic tabletop wargame in 1997. The only things we love more than Space Marines are giant robots! That's Epic with a capital 'E'. While Warhammer 40,000 and its Dawn of War PC games focus on small-scale tactical battles with no more than a couple of tanks and a few dozen troops, Epic features battles between armies of hundreds of soldiers and dozens of tanks. It also has Titans, walking war machines that stand over one hundred feet tall. It is, well, epic! While Titans have appeared in the Dawn of War series – the campaign in Winter Assault saw you fighting desperately for the chance to recover one – they don't really fit into the squad-based scale of Warhammer 40:000. In 1997, however, Games Workshop released Final Liberation, a tactical PC game that let you take control of these massive weapons of war. It doesn't look like much now, but we can always hope for another Epic game! 6. Made a full-length CGI movie in 2010 called Ultramarines. Dark and gritty like a Warhammer movie should be. The Ultramarines are one of the most well-known chapters of Space Marines in Warhammer 40,000. You may recognize the hero of the third-person shooter Warhammer 40,000: Space Marine, Titus, as an Ultramarine, since he sports their distinctive blue power armor. You may not have known, however, that the Ultramarines also feature in an eponymous CGI movie created by Games Workshop. 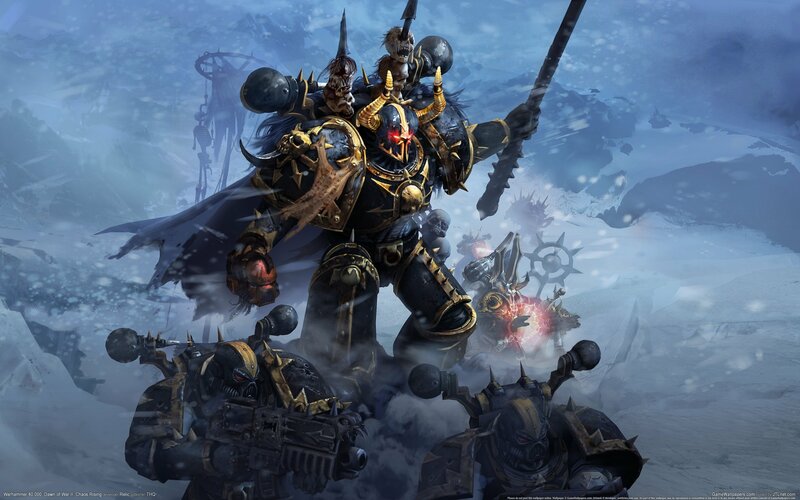 Written by Dan Abnet, one of the most popular writers for Warhammer 40,000 fiction, Ultramarines sees a squad of the blue-clad Space Marines desperately fending off the forces of Chaos. For any fan of the games, the film is 70 minutes of pure entertainment. 5. Has changed the names of its brick-and-mortar shops from Games Workshop to Warhammer. Let's face it: it's hard to get more recognizable than this. Games Workshop stores are a familiar sight in many cities, and their PC games have no doubt introduced many players to the original table top versions of Warhammer and Warhammer 40,000. Over the last year, however, Games Workshop has been changing the name of its storefronts, which are now simply called Warhammer. The company is still called Games Workshop, but this rebranding of its stores will no doubt help to attract a wider audience. 4. Released a FPS in 2003 featuring the Tau, called Warhammer 40,000: Fire Warrior. This art looks far better than the game does! 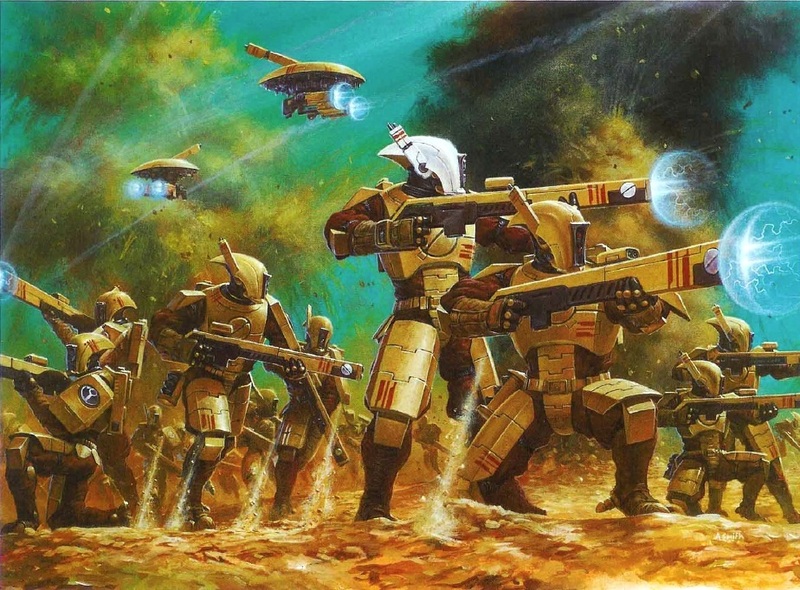 Those of you who have played Dark Crusade will be familiar with the Tau, the idealistic warriors who fought for the Greater Good with superior ranged firepower. 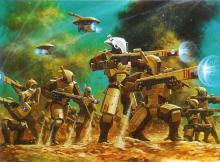 Well, the Tau featured in a PC game several years before Dark Crusade came out, and only two years after the Tau were introduced into the tabletop game. 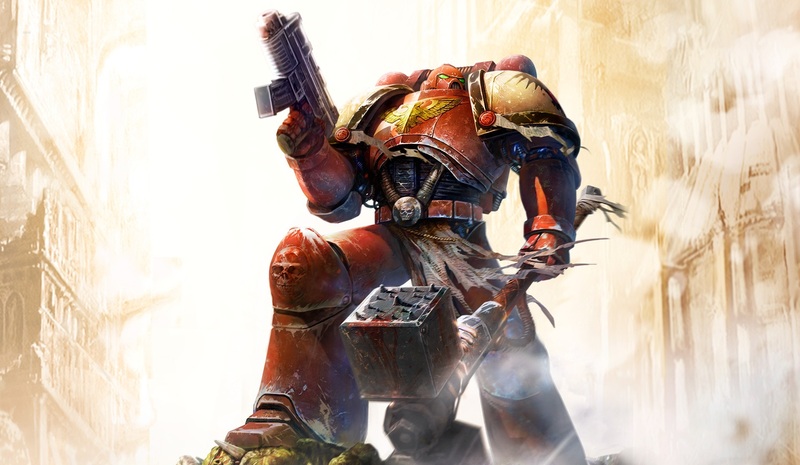 Fire Warrior was not particularly well-received on the PC, hence its relative obscurity, but it showed that the Warhammer 40,000 license could be made into a shooter, so we may have Fire Warrior to thank for the much better Space Marine! 3. Gave Cyanide the license to make Blood Bowl after initially bringing a lawsuit against them. Cyanide and Games Workshop make a good team. In 2004, Cyanide Studios released a game called Chaos League, a satirical American football game set in a medieval fantasy world where teams composed of elves, dwarves, orcs, and other races fight it out against each other on the pitch. Sound a bit like Blood Bowl? Games Workshop thought so too! Apparently, Cyanide approached Games Workshop to pitch a Blood Bowl game, but were originally rejected, and made Chaos League instead. Games Workshop brought a lawsuit against Cyanide for the numerous similarities between the two titles, but happily everything ended well. After negotiations, Games Workshop gave Cyanide the license to make Blood Bowl games, the first of which was released in 2009. 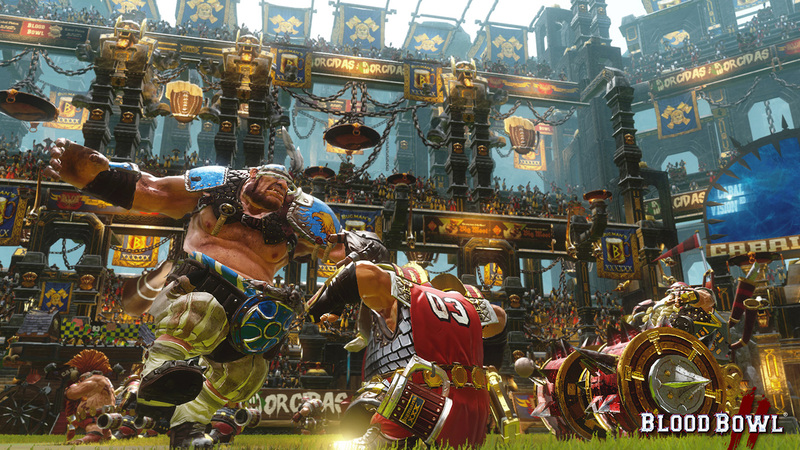 That one was successful enough to warrant a sequel, and Blood Bowl 2 is due to be released in September 2015. 2.Recently canceled its long-running Warhammer Fantasy line. That's armor that rivals a Space Marine! Games Workshop premiered its Warhammer Fantasy table top game in 1983, which has been the basis for its most successful table top and PC games ever since. In July 2015, however, Games Workshop announced that it was finally retiring its Warhammer Fantasy line, replacing it with the small-scale and beginner-friendly Age of Sigmar game. The PC game market has yet to see the result of such a change quite yet, but there seems to be little doubt that Games Workshop will soon transfer Age of Sigmar to PC, so we may have another exciting series from Games Workshop to look forward to in the future! 1. Games Workshop has had a strong interest in computer gaming right from its foundation – in 1975! Games Workshop's iconic Space Marines. According to Steve Jackson, one of the founders of Games Workshop, the company was interested in promoting “progressive games” since the beginning, and in 1975 computer games were “progressive games”. However, it wasn't until the mid 1980s that Games Workshop had the opportunity to start making computer games, and it was only in the early 1990s that they finally started to bring their Warhammer franchise to the PC. Thanks to this 40 year-old dedication to computer gaming, we can be sure they'll be putting out more good games for years to come.